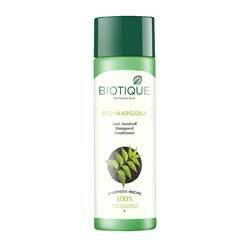 Biotique Herbal Bio Margosa Anti Dandruff Cleanser. Leaving hair lustrous and manageable. The natural sap of the Margosa tree along with Euphorbia and Bhringraj help to eliminate dandruff and scalp infections. Deep cleanses scalp and hair, leaving hair lustrous and manageable. Apply appropriate amount to hair. Massage in a circular motion. Rinse well. Always use cold or just luke warm water.